19th Annual Wall Street Project Economic Summit Kicks Off Today! Today, hundreds of corporate executives, minority entrepreneurs and community leaders gather to kick off the Rainbow PUSH Coalition and Citizenship Education Fund’s 19th annual Wall Street Project Economic Summit at the Sheraton New York Times Square Hotel in New York City. For the next three days, the Wall Street Project Economic Summit will be advocating for equal opportunities for culturally diverse employees, entrepreneurs, and consumers in the financial sector, while challenging corporate America to end the multibillion-dollar trade deficit with minority vendors and consumers. Summit speakers include U.S. Sen. Chuck Schumer (D-NY); U.S. Rep. Maxine Waters (D-CA), ranking member of the House Committee on Financial Services; the Hon. Michael Frerichs, Treasurer for the State of Illinois; the Hon. Scott Stringer, Comptroller for the City of New York; and Kurt Summers, Treasurer for the City of Chicago. Also confirmed to participate are John Rogers, President, CEO and Chief Investment Officer, Ariel Investments; Suzanne Shank, President and CEO, Siebert Brandford Shank & Co.; Johnny C. Taylor, President and CEO, Thurgood Marshall College Fund; Dr. Calvin O. Butts III, Senior Pastor, Abyssinian Baptist Church. This will certainly be a full and fascinating few days for learning, expanding, evoking change and even entertainment.Â Seven-time Grammy Award-winner, Rock & Roll Hall of Famer, and Earth Wind and Fire vocalist Philip Bailey will be performing live. Register nowÂ to attend the 19th annual Wall Street Project Economic Summit and be an advocate for prosperity and change. 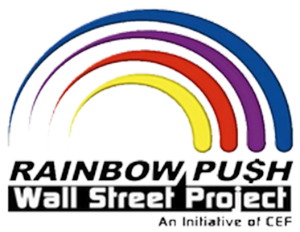 For more information on the Summit and the work of the Rainbow PUSH Coalition and Citizenship Education Fund, be sure to visitÂ www.rainbowpushwallstreetproject.org. For updates and live information follow @wallstreetproj on Twitter.